The Holly Tree Resort Hotel This resort is located in the heart of Cape Cod, making it close to all the major attractions. Accommodations: You can choose from studios, one bedroom suites, and deluxe suites. In each studio, you’ll find a double bed and either a double or twin size sleeper sofa, along with a master bathroom. On the other hand, the one bedroom suites come with a king size bed and a queen size sleeper sofa, along with two master bathrooms. All the units have a fully-equipped kitchen and complimentary Wireless Internet. The Deluxe suites, being more spacious than the other units, come with their own indoor whirlpools. Resort features: There are numerous of activities you can enjoy at the Holly Tree Resort Hotel, making it ideal for someone looking for a remarkable timeshare resale property for sale in this area. Some of these features are the indoor and outdoor swimming pools, basketball and racquetball courts, picnic sitting area, fitness center, and arcade room. You really have a lot to do here, so you’ll never feel bored. 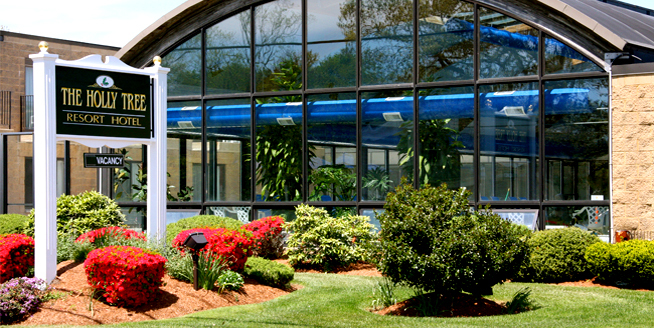 Nearby attractions: The Heritage Museums and Gardens is 19.2 miles away (about 26 minutes driving distance), Chapin Memorial Beach is 10.2 miles away (about 22 minutes driving distance), Sandwich Glass Museum is 18.5 miles away (about 23 minutes driving distance), and Breakwater Beach is 15.5 miles away (about 25 minutes driving distance). You can also visit Martha’s Vineyard, which is 56.3 miles away (about an hour and 54 minutes of driving and traveling through the Woods Hole-Vineyard Haven Ferry). Cape Cod Holiday Estates Unlike The Holly Tree Resort Hotel, which is in the Mid-Cape area, this resort is in the southern coast of Cape Cod. Accommodations: You can choose from one, two, or three bedroom vacation homes. Each unit includes two master bathrooms. The two and three bedroom homes come with a whirlpool tub; however, all the units, even the one bedroom units, are spacious and luxurious. All the vacation homes have a fully-equipped kitchen, complimentary Wireless Internet, two televisions, a deck or a patio, and a vacuum. The two and three bedroom vacation homes also come with a washer and dryer. Resort features: Just as with the previous resort, this one has many activities you can partake in. Some of these features are the indoor heated swimming pool, basketball and tennis courts, game room/arcade, and a children’s playground. Nearby attractions: The Cape Cod Holiday Estates are much closer to certain attractions than the previous resort. This is perhaps a reason why this resort is such a great place to look into some timeshare resale properties. For instance, South Cape Beach is 2.8 miles away (about 7 minutes driving distance), Martha’s Vineyard is 28.6 miles away (about an hour and 33 minutes of driving and traveling through the Woods Hole-Vineyard Haven Ferry), the Heritage Museums and Gardens are 14.8 miles away (about 26 minutes driving distance), and Sandwich Glass Museum is 14.1 miles away (about 24 minutes driving distance). The Holly Tree Resort Hotel and Cape Cod Holiday Estates are both lovely resorts in Cape Cod with fabulous timeshare resale properties. Being near all the wonderful Cape Cod attractions, you’ll surely find yourself in paradise all while you have a relaxing, fun stay. Previous Previous post: Timeshare for Rent at Wyndham’s National Harbor in D.C.